As we continue to learn more about the different types of magazines out there, we’d be amiss by not mentioning AK’s. What is an AK? Known as the AK-47, this is an assault rifle originally from the Soviet Union, coming about around the end of World War II. Developed initially for the Russian military, the AK-47 is now the most popular and widely used assault rifle in the world. This is due to their reliability, low production costs (as opposed to lots of Western developed weapons) and their widespread availability. What type of magazines does an AK use? A standard AK-47 magazine capacity is 30 rounds. They come in multiple round however from 10, all the way up to a 75 round drum magazine. How are AK Magazines different? 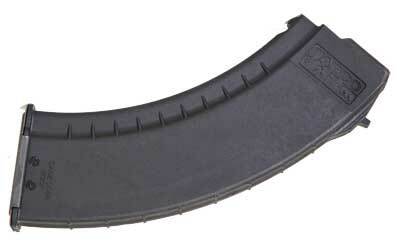 AK-47 magazines are knows for their pronounced curve that helps to smoothly feed the bullets into the chamber. They’re constructed from heavy steel, making them resistant to damages. The magazines are knows for their strength; soldiers have even used them for hammers out in the field. One of note is the US Palm AK30 that have been revamped recently with thicker feed lips and locking tabs. They are very light weight and handle well. Another choice is the Bulgarian Circle 10, which is typically thought of as the best of the best in AK magazines. The circle 10 has a polymer body with steel reinforcements and locking tabs that are extremely difficult to break. There are plenty of choices of AK magazines on the market, so what does a customer need to avoid when picking one? Definitely do not purchase magazines that are polymer without the metal reinforcement; they’ll crack and chip easily. Another item avoid; Bulgarian polymer bullet mags. They have similar problems to the polymer magazines that are not metal reinforced, and are nothing like the Bulgarian Circle 10 in terms of consistency and reliability.